I had to show off today's bread. I tried a new cracked wheat recipe from King Arthur Flour. There are two variations for this recipe: two types of sweetener (molasses or honey) and two types of whole wheat flour (standard or white). This would be a great mathematics problem if I made it more interesting with more sweeteners and other ingredients and then ask how many different types of bread could you make with the recipe. Of course for this recipe the answer would be 2 • 2 = 4 types of bread (honey and white whole wheat, honey and standard whole wheat, molasses and white whole wheat and molasses and standard whole wheat). I used the cornstarch wash from Artisan Bread in Five Minutes a Day: The Discovery That Revolutionizes Home Baking in order to have a prettier loaf with the cracked wheat on top. The bread is soft like comfort food and is easy to slice for sandwiches without falling apart. 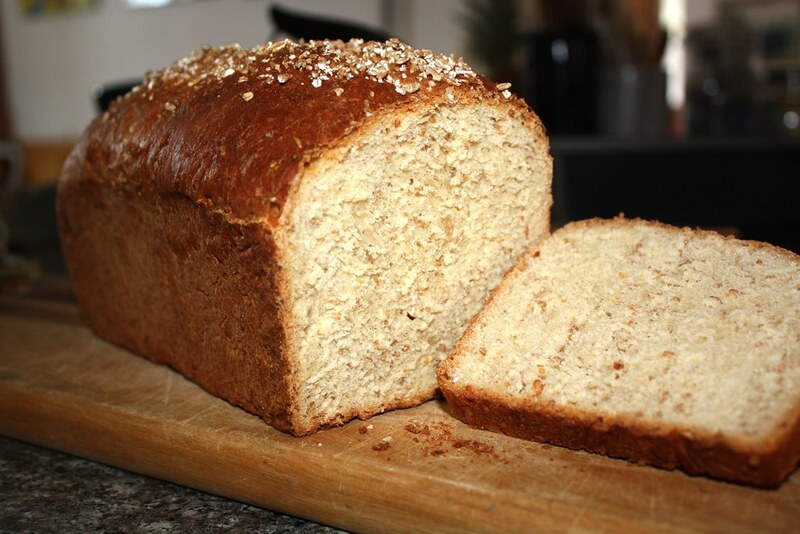 To see the recipe for this loaf, go to my recipe blog. This was a very popular recipe for John, who has nearly finished it off so that I need to make more in the morning!